We have managed to resurrect none other than Mary Shelley. We are most grateful, she has agreed to do an exclusive interview with us. Interviewer: Welcome Mary, I suppose it must be a little strange being alive once again and in a totally different era. Mary Shelley : Being brought back from the dead, was not something I anticipated. Mary Shelley: Yes , I suppose, it certainly got more complicated when I met Percy (Bysshe Shelley). Father didn’t approve. Do you know we used to meet at Mother’s grave. Father was fuming when I returned pregnant from France, he had his reasons, Percy was not greatest of choices for a partner; given that he was married to another woman, I found myself ostracized by many on account of this. We had no money and Percy was always running away from debtors, times were hard. My life was characterized by tragedy and death, of course Percy was taken in a storm, a sailing accident. In truth my previous life was a tangled mess. Interviewer: You achieved success at quite a young age, how did it feel? Mary Shelley: It was quite strange at the time. I published my book Frankenstein: or The Modern Prometheus anomalously, indeed people attributed this book to Percy, it was he who set up the publishing deal and did a lot of the proofing, to an extent he was almost a co-author. Five years on I accredited for writing the book. 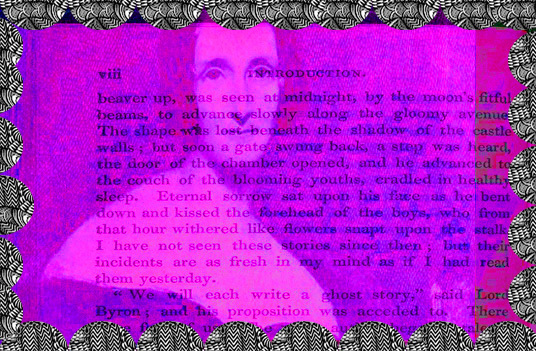 It all came about because George (Lord Byron) had this idea to set up a challenge to see who could write the best horror story. We were in Italy during a period of the most awful weather on record. My idea for Frankenstein was born out of dream. My book seems to have touched many people and is still talked about in this day and age. Interviewer: Much later after you death, your book has been adapted into films, you have had the chance to watch some of these, I believe, how do you feel about the film versions?